Yes, it’s true. Everything I want to do this year for the holidays is because of Pinterest. So sue me! I can’t help it. So.many.fun.ideas. One of the easiest that it’s impossible to miss? 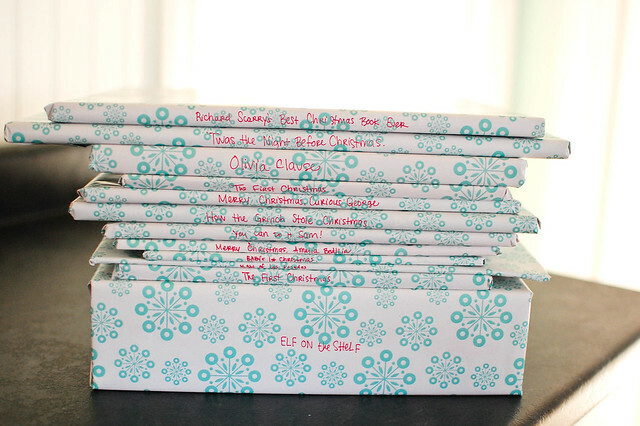 The ubiquitous wrapped books for December from Katherine Marie Photography’s blog. In that post, she suggests wrapping one for each day leading up to Christmas and we could have done that. But, seriously? We don’t need 24+ Christmas books, so I decided to sit down with the kids and sort. They picked their favorites and we decided to donate the rest. I wanted to do this especially early so that they could go through the books and still forget about them by the time December rolls around. Plus, that gives me time to get the extra books donated somewhere or given to other families in time to use them leading up to the holidays. So, we had a stack. Wrapped them. Also labeled the spines, just in case Mommy or Daddy especially feels like reading a certain book. Done! Now they’re waiting on the shelf in the basement for December to go under the tree. Such a fun, easy project. Also: If you want an even easier project for holiday books, last year we got a basket at Salvation Army and stuck them all in there so that they were all in one spot. Can that even be called a project? Maybe not, but it is nice to have ideas for wrangling everything into one spot. We’ll get it out again this year for the wrapped and unwrapped books and we’ll have another for cards that start rolling in. I loved having them out where the kids could get to them and read the books and play with the card. Ha! We are so on the same page; I wrapped my books last week! Such an easy and fun idea! You gave me an idea. I don’t have children but as a Christmas decoration I could wrap non-Christmas books and write the name on the spine for decoration. Take the phone book, wrap it, and write “A Christmas Carol” on it and place it. I could take various sized books and do this.